I last left you in St. Thomas. 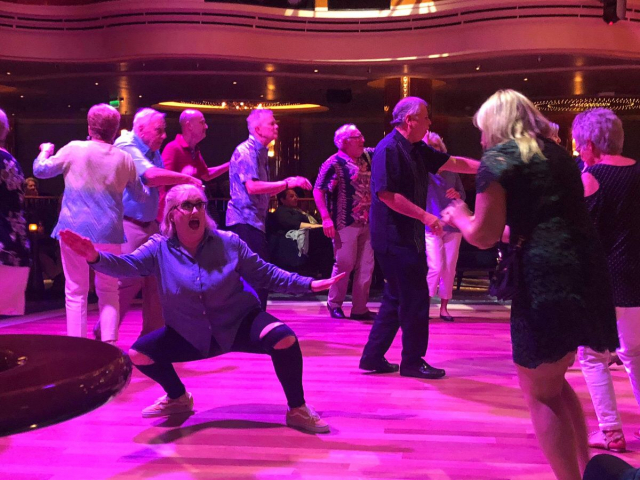 My third day aboard Nieuw Statendam was spent at sea. 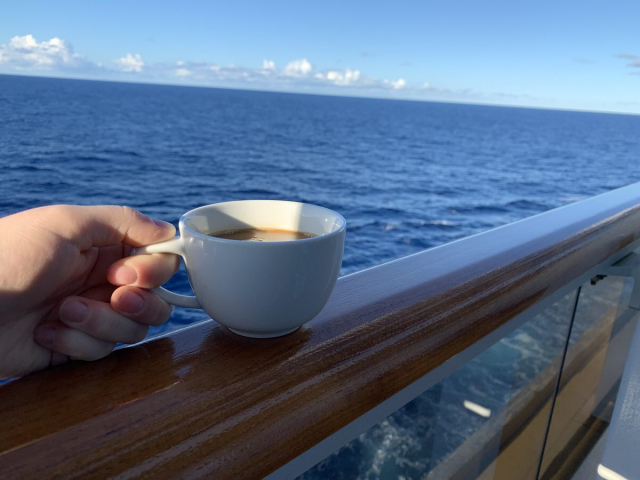 Some of my favorite days aboard ships are at sea, especially when they are in the middle of the cruise. By that time, you have gotten to know people and you have gotten familiar enough with the ship that there are plenty of things to do. My sea day aboard Nieuw Statendam was no exception. Natalie, my travel companion, and I had big plans for the day that involved trivia and of course, music. Before we started any of that though, we had to eat breakfast. Club Orange members are able to order room service free of charge. For me, a day at sea is a day to sleep in, and sleeping in is complemented perfectly with room service. Natalie ordered toast and Nutella, a favorite of hers. I opted for a bit more of a traditional breakfast, eggs and oatmeal. Our waiter brought the breakfast to our room, although getting it to the balcony took a bit of finessing because the pullout couch was a bit of an obstacle, as I mentioned in an earlier post. Once we were outside, however, we had a delightful breakfast looking out onto the sea. After breakfast, we decided to go down to Billboard to play trivia. The trivia game was fun, although geared to a slightly more mature audience. Natalie and I managed to get a couple questions right, but the real fun was in spending time with other guests. Natalie and I ate lunch in the Lido Market where she had an Asian inspired noodle dish and I had a salad. And I topped my salad with beets, goat cheese, black beans, and more, and it was tossed for me in my dressing of choice. There was variety at that station, and I enjoyed the option of customization and personalization. I was disappointed that I was only able to visit the Lido Market for a salad once because it was so good. Throughout the day, we just hung out around the ship. There were plenty of activities ranging from classes on cybersecurity to cooking demonstrations from America’s Test Kitchen. Active travelers can take part in sports ranging from pickleball to basketball on the Panorama Deck. For dinner, we dined with our group at Tamarind. 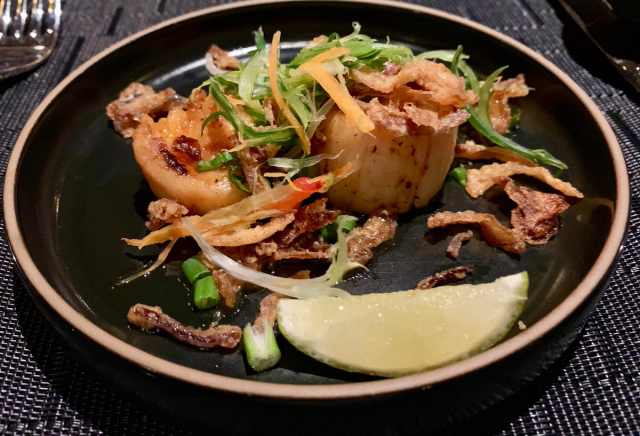 Tamarind is the Asian-style restaurant aboard Nieuw Statendam. It is next to a sushi restaurant, but Tamarind itself does not offer sushi on the menu. 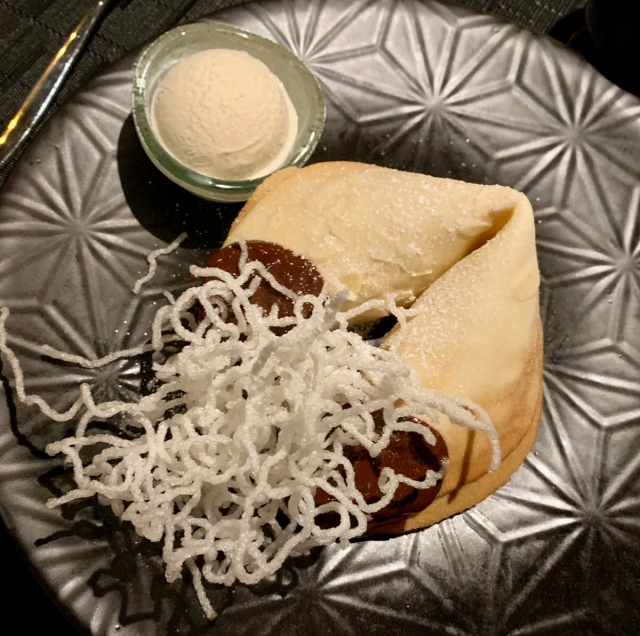 I ordered lime scallops, a wasabi crested steak, and a giant fortune cookie. It sounded like the most spectacular dinner ever. Was it? Pretty close. The steak was by-far my favorite part of the meal. In fact, it was so good that I was too busy eating to take a photo of it. The wasabi flavor was strong but not overpowering, and the cut of filet was cooked perfectly rare – just like I like it. Although the steak was my favorite of the meal, the real star of dinner was the fortune cookie. Ordered by almost everyone at my table, the fortune cookie was the topic of conversation at the dinner table for a good 15 minutes. My only issue with it? There was no fortune. But that it made it easier to eat. We spent the rest of the night just like we did all the others – dancing the night away. Natalie and I broke off into a smaller group with a few close friends who we had spent much of the cruise with. We spent a bit of time dancing at The Rolling Stone Rock room before heading over to Billboard to hear a few songs on the piano. Although I was upset because my requests were taken by the pianists, Billboard was still the highlight of my night. Not because the music was better than any other venue, but because of a very special moment that I happened to witness before leaving. This was one of those moments that makes cruising so special. 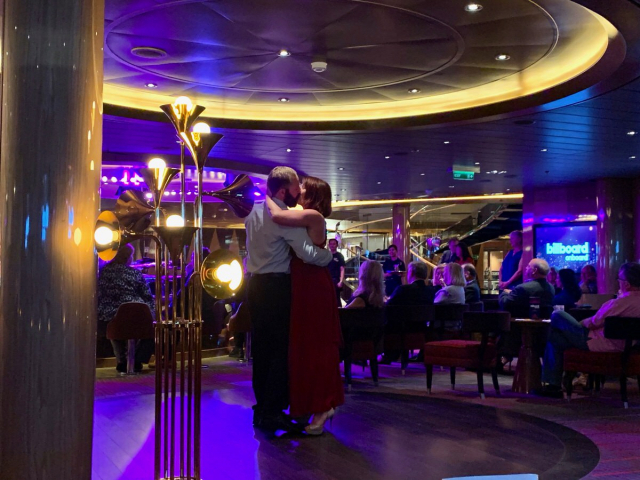 The pianist was able to learn a song for Kim and Justin in order to make their night- and possibly their entire cruise. Our group then headed to B.B. King after experiencing that special moment and danced into the next day.